Looking for an easy way to utilize what I consider the two best tools in Seesaw? Here you go! 1. Have your students take a selfie and post it! Your students will love looking back on that photo at the end of the school year. Spend some time familiarizing your students with the camera tool once they tap on it. I like to teach our students to take photos with the iPad in landscape (horizontal) mode. I talk with them a bit about digital leadership as well. We talk about not taking pictures of other students, paraprofessionals or teachers without asking permission first. I like to model what a good selfie "looks" like, being sure to include my whole face and not part of it. Be sure to teach your students to LOOK at the camera. This will take a bit of practice at first with your younger students. You may have to practice this a couple of times. Happy snapping! 2 . 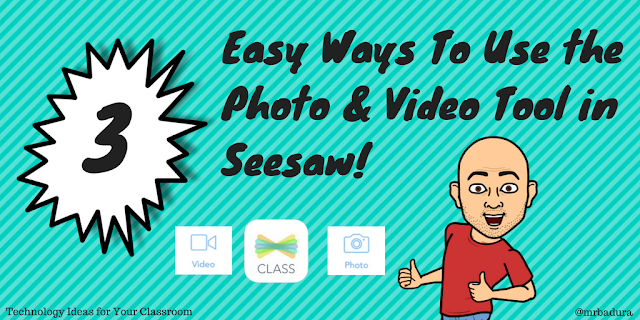 Have your students create a video tour of their classroom (while narrating) using the video tool in Seesaw! I love doing this activity because it gets students up and moving around the classroom with their device. Too often we want students to remain stationary while using their device for fear of them dropping the iPad. Let's teach them how to move around the room while holding a device! Again, emphasize holding the iPad in landscape mode while recording. Before we begin recording or videos, I discuss with students what a good video would look like. I then encourage students to move around the classroom while narrating about certain areas in the classroom. When done recording, I have them come back to a central meeting place to review their videos. Your students will notice that their first attempts aren't very good. That's okay! Talk about what they could do better if they were to shoot the video again...and then have them go do it! Turn those videos in when done so your parents and students can view them. This will also be a nice digital artifact to look back on to measure progress as your student create and hone their video skills throughout the year. Below is an example of our second graders recording their classroom tours. 3. Make thinking visible in your classroom by having students use the video tool to reflect. Pose a question to your students after a lesson, chapter or unit of study then have them reflect. It's a great tool for you to gauge where they are at in the learning process. What about a video reflection exit ticket? Easily done with the video tool! Perhaps you are having student presentations in your classroom. Pick two or three students to give feedback to each student presenter. It's so easy! You can also have students reflect using a still image. Snap a pic and have students record their reflection with just their voice. Below is an example of how I had 1st-grade students reflect on our lesson after I shared my Digital Citizenship Survival Kit with them.